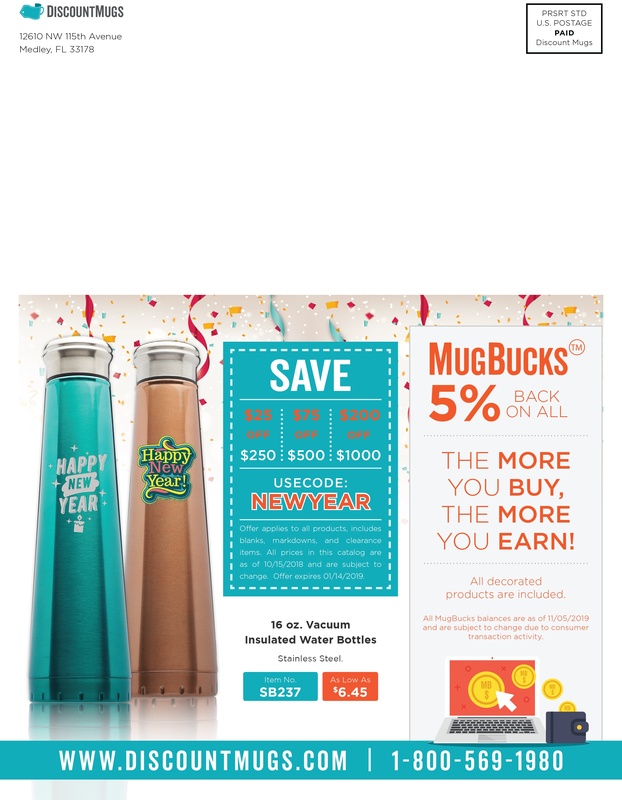 2019 DiscountMugs New Year Catalog! December is officially here and as hard as it is for some of us to believe, the year is coming to an end. Around this time of the year, most of us reflect on the laughs shared with the ones we care most about and the trying moments that strengthened our relationships. This is also the time to ask yourself questions like where do I want to be in a year from now? Or what do I envision for the future of my business? And what are my plans to get there? 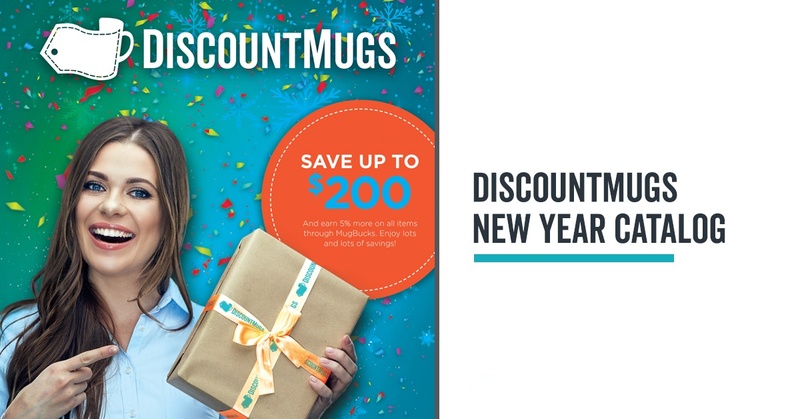 With such questions in mind, and our commitment to empower you to share your message and create lasting impressions, we’re pleased to announce the release of 2019 DiscountMugs New Year Catalog! 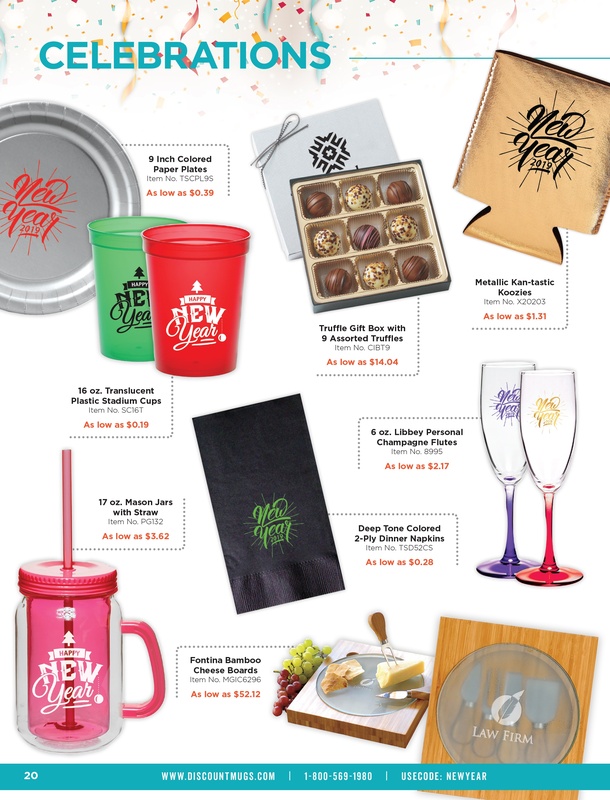 This season’s edition highlights new arrivals, inspiration for your year-end-celebrations, and huge savings to help make your promotional efforts and personal events even more affordable in the New Year. Whether you're looking for sparkling decorations and party favors for your lavish corporate festivities or innovative giveaway ideas to revamp the presence of your brand in the new quarter, our custom promotional products can help meet the expectations of your audience. Take a dive with us to get inspired and don’t forget to download our digital catalog to share on the go with colleagues and friends! Did you also leave all of your holiday shopping for the last minute? Sigh, we’re all guilty as charged! 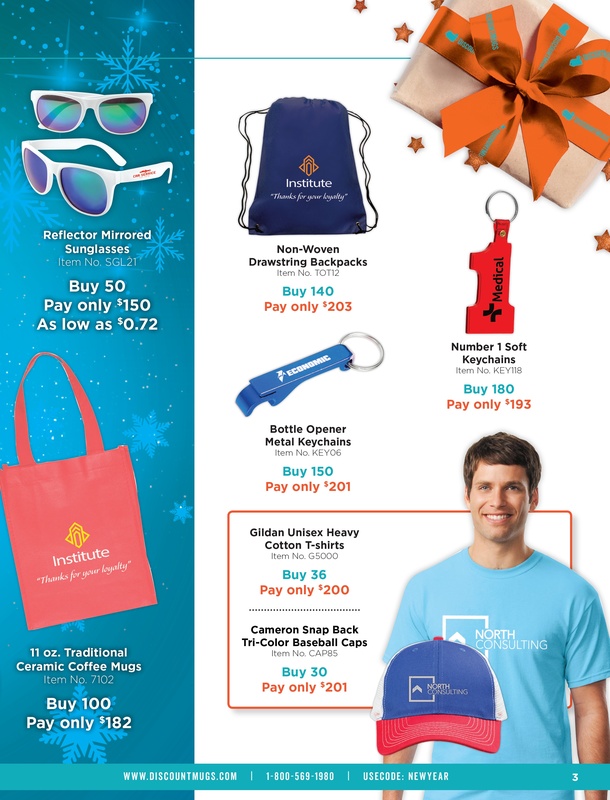 Although it may sound strange to the general population, everyone in the promotional product industry knows a lot of thinking and effort goes into selecting personal and thoughtful holiday gifts your organization can be proud of. 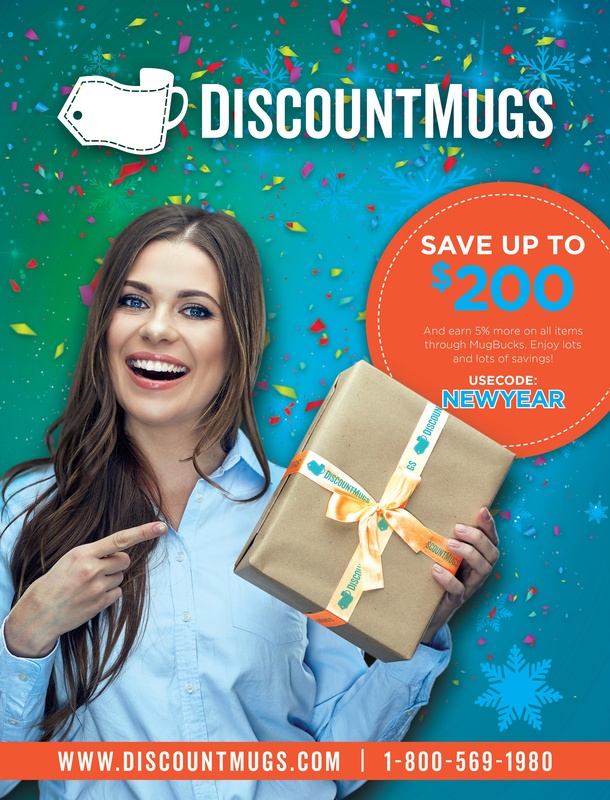 DiscountMugs is a trusted leader and manufacturer of promotional items and our catalog includes several classic, quirky and luxurious gift ideas that will send just the right message to your audience. Take a peek below and get playful with your artwork over at our Design Lab now! Are you as excited as we are about our new arrivals? At DiscountMugs we keep up with the industry’s latest and trending promotional products to bring you custom items your audience will actually enjoy. Our research shows the community is experiencing an invigorating sense of energy and optimism for the New Year, which translates into positive, flashy and awakening color pallets. 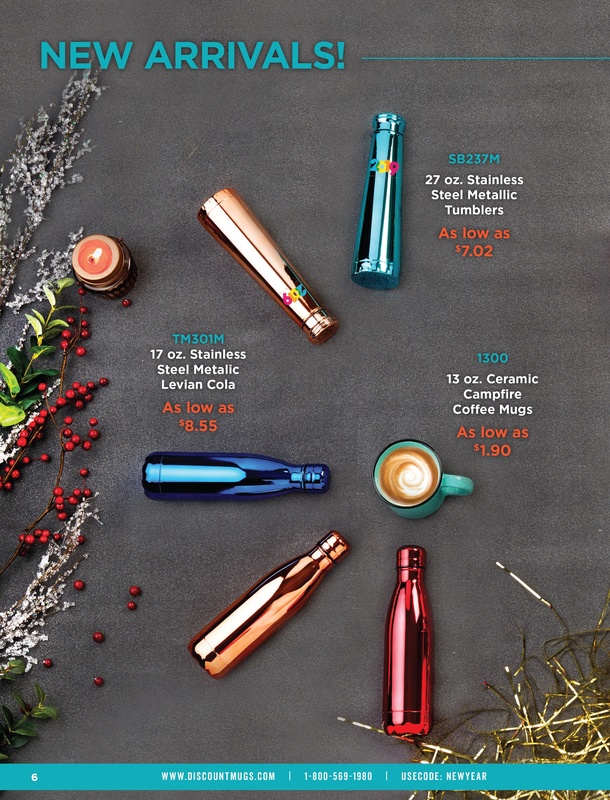 The renewing energy of the future met our wholesale promotional products and came back with shiny and metallic shades we can all get behind. Blow the horn and pop the confetti poppers, our bright metallics are in! 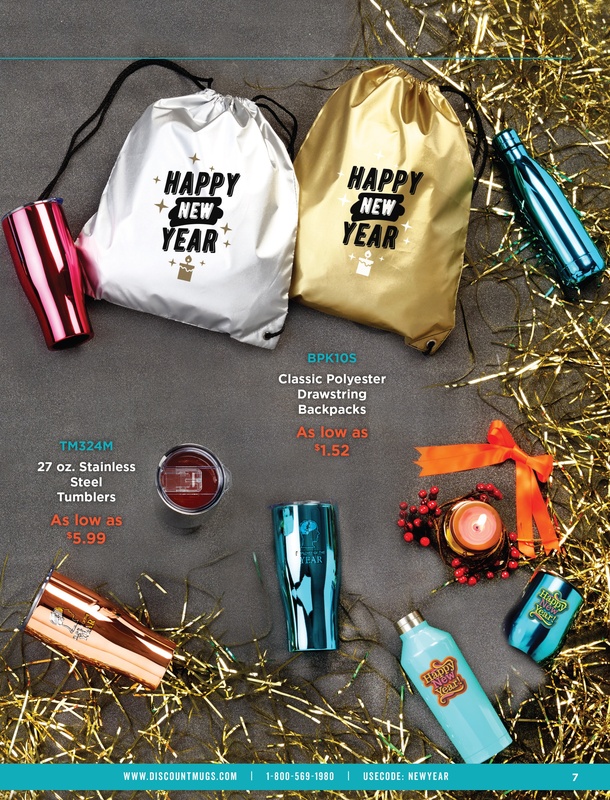 New Year’s Eve is one of the most magical nights of the year and providing your guests with cool giveaways that are also useful can help increase your brand exposure and presence. If you’re looking to excite and engage them, you need to think in terms of valuable marketing strategies they’ll remember fondly months after your event. Unforgettable may sound a little scary to you, but some thing original, convenient and pragmatic will do just the trick. Backpacks, water bottles, travel tumblers and mugs are all cost-efficient and practical personalized gifts you can rely on. Select the right item for your brand and head over to our Design Lab to start customizing today. Life is short, which is why you always hear people saying one should make time and travel more. The holidays are a great period to travel, too. You probably don’t hear that a lot – lines are longer at the airports and touristy crowds tend to gather in larger numbers. However, the end of the year is a time when towns and cities put up all of their season decorations (e.g. lights, religious paraphernalia, and New Year's Eve decorations), seasonal theme parks re-open their gates, and everyone gathers to celebrate the year just passing. 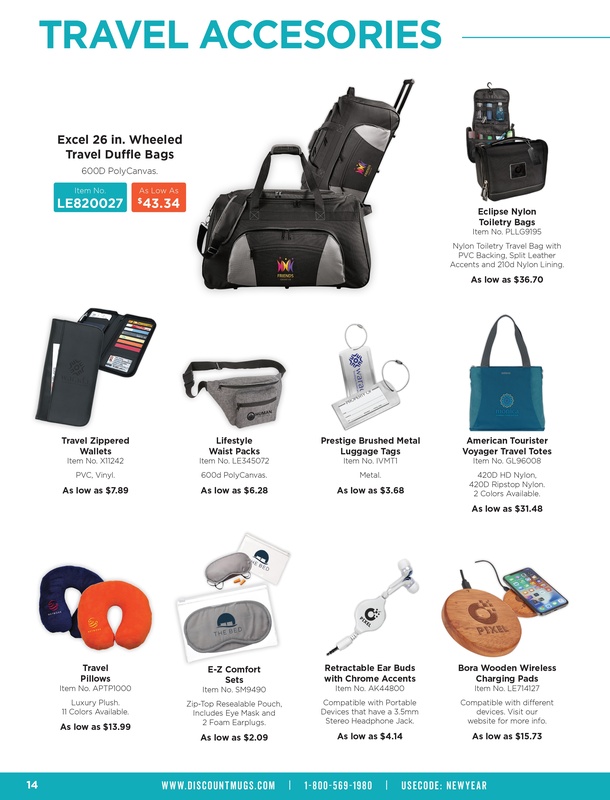 Raucous as it may sound, the environment will attract many, thus travel accessories personalized with your brand logo can make just the perfect promo. Live it up, travel more, and take your brand on the go. The year end party, whether for the office or one you host for family and friends, should be more that an ordinary celebration. Now just around the corner, your planning committee should be making all the preparations and final decisions for a spectacular gathering. The year-end-bash can help strengthen your relationships and close out the calendar. A time when all gather to celebrate hard work, team effort, and just love in general, our fun party favors can be personalized with your brand logo or message to last as a memento of your celebration. Glassware items, koozies, and party cups are some of the usual suspects among our customers. Combined with the season of goodwill, the year-end-wrap brings everyone together under a common goal. If you already have rituals in place, such as award ceremonies, you’re probably ahead of the herd. If you aren’t, the arrival of the New Year gives you an opportunity to connect with your employees and those who have helped you along the way. This year was probably one of the most stressful years yet, allow everyone to blow the valve and release some steam. 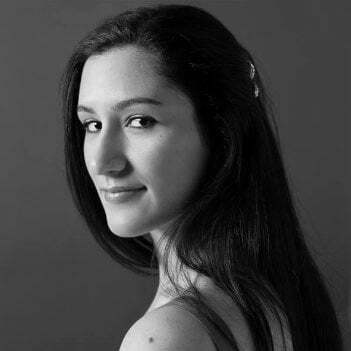 The idea, however, is to get a head start and get all of your planning in now! Browse our New Year Catalog and download in PDF format to look at in your spare time. Get ready for the noisemakers and relax, at DiscountMugs we’ll take care of the rest.